Episode 40 - This one starts with some girl talk. Draupadi and Satyabhama get bored of Markandeya's endless mythologies, and sneak off for a more private conversation. Satyabhama wants to know how Draupadi maintains her hold over all five husbands. Draupadi then advises us on the behaviors a woman should perform to keep her husband from straying to other women's beds. Krishna too finally gets bored of Markandeya and decides it is time to head for home. He loads up the wife and they head out. If he knew of the impending attack on his friends, he didn't bother to tell them. The scene then changes to the court at Hastinapur, where Dhrtarastra is getting news of Arjun's return from heaven with the WMD and how they seem intent on waiting out their exile before taking revenge. Duryodhana overhears Dhrtarastra's lament, and calls a meeting of his cronies. Karna suggests they go out to watch the Pandavas in their misery and laugh at them. What ensues is the Cattle Expedition. It was great listening to this podcast series so far. 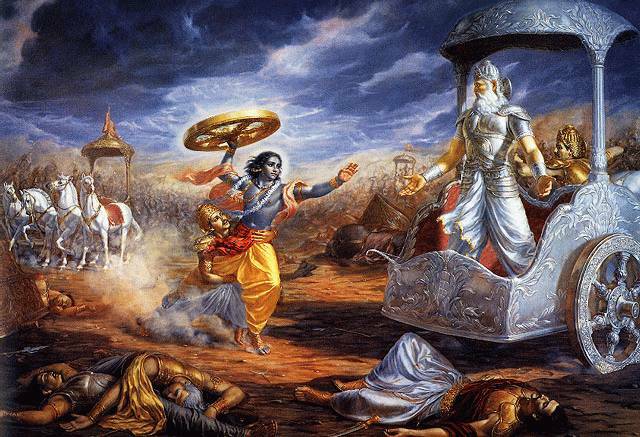 I recently read a book interpretation of the Mahabharata and then chanced upon this podcast series which i am using as a sort of revision to internalise the story. The website also contains many articles reprinted from newspaper and magazines by the author. The book itself gives many perspectives to the Mahabharata which i have not found elsewhere. It relies upon the various regional additions for interesting back stories of each of the characters. However, it is the final concluding chapter makes reading this book worthwhile. It rare to find a rational and/or humane explanation of the point of senseless series of acts of violence, retributions etc. Surprisingly the conclusion is congruent with other Indian philosophical systems such as Buddhism and Jainism. Thanks Jose for sharing your perspective on Mahabharata. I am also a avid listener of this Podcast. If you like this Podcast you will also like a podcast by Ben Collins on Hindu Mythology (http://www.puja.net/Podcasts/vedicmythology.xml). He also gives great explanation to the symbolism of Indian Mythological Stories with good diet of chanting n great Vedic music.